Upwards movement was expected for a correction. The clearest piece of movement is the downwards movement from the high. This looks like either a complete five down, or an almost complete five down (if the fifth wave is incomplete). This may be the start of a larger correction. However, I am concerned (after my experience with AAPL) that GDX may not have enough volume for its waves to look always or almost always clearly like threes or fives. I do not have complete confidence that the invalidation point at 66.98 may not be passed. There is no Fibonacci ratio between intermediate waves (3) and (1) (I checked again, and my last analysis was wrong on this point). There is alternation between a deep expanded flat for intermediate wave (2) and a very shallow zigzag for intermediate wave (4). At 14.13 intermediate wave (5) would reach equality with intermediate wave (1). Minor wave 1 lasted 83 sessions. I would expect minor wave 2 to last a few weeks. So far it has lasted 16 sessions. It may end in a total Fibonacci 21 or even 34 sessions. 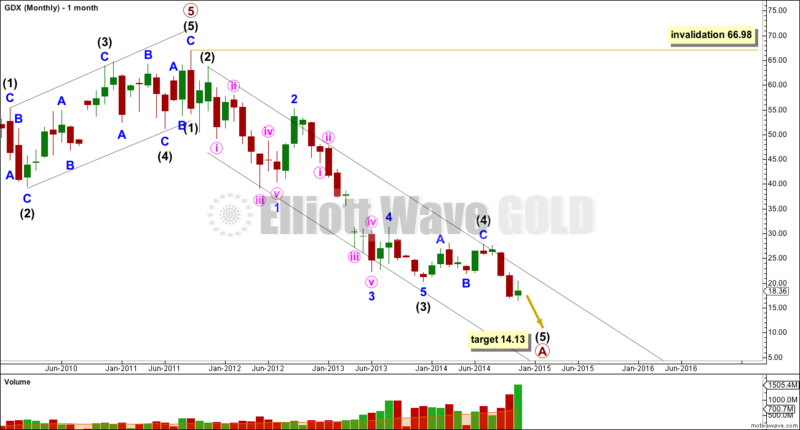 Within it minute wave b may look like a clear three on the daily chart. 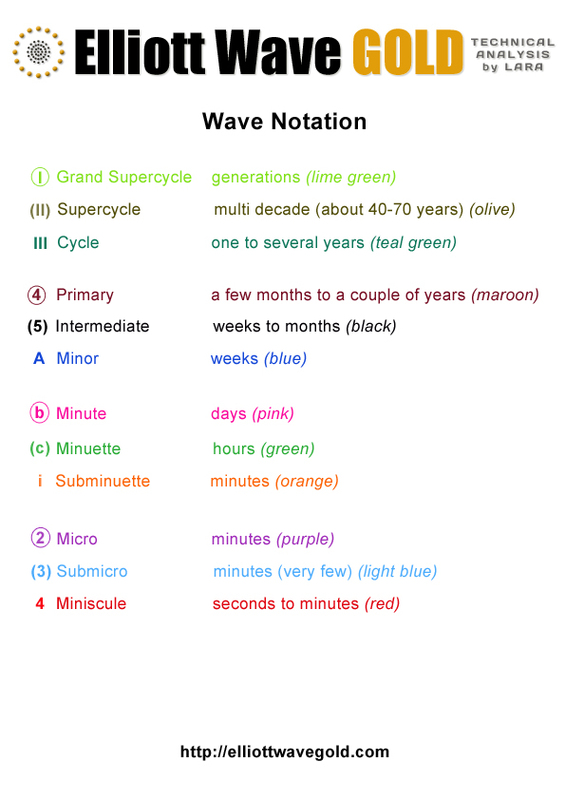 If minute wave a has subdivided as a five wave impulse as labelled then minute wave b may not move beyond the start of minute wave a below 16.45. Thereafter, minute wave c upwards would be highly likely to make a new high above the end of minute wave a at 20.42 to avoid a truncation. It would be most likely to end about the 0.618 Fibonacci ratio of minor wave 1 at 23.45. Minor wave 2 may not move beyond the start of minor wave 1 above 27.78. If this price point is passed I would use the alternate below. 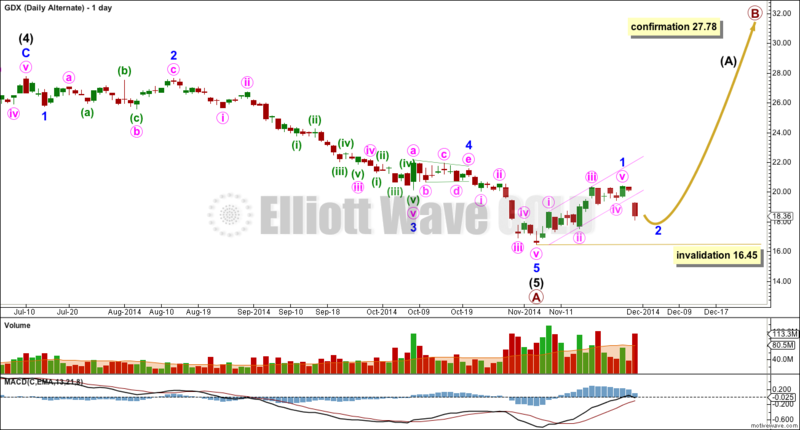 For GDX it is possible that primary wave A is over. If primary wave A is a complete five wave impulse downwards, then there are no Fiboancci ratio between intermediate waves (1), (3) and (5). However, this is only slightly unusual for GDX in my short experience with this specific market. If primary wave A is over then within the new upwards trend no second wave may move below the start of its first wave at 16.45. 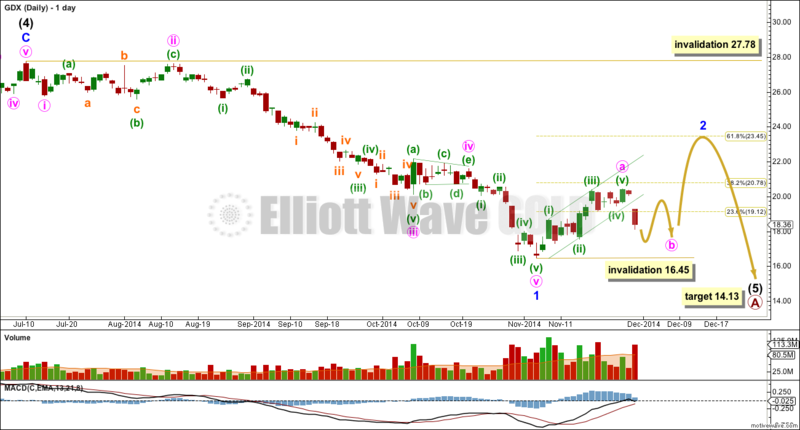 This alternate would be confirmed when the main wave count is invalidated with a new high above 27.78. Hey Lara, in the bigger picture I think/hope you’re totally right here with the alternate on GDX. The shake-up/out on holiday trading is in-itself ominous. I see that on the 5-min chart the 2nd highest vol move occured in the very first 5 min of trade (4.5 million) red. The highest for the day was in the last 5 min before the 1pm close with a green candle with 10.4 million shares. If you look at an individual company e.g. AEM the volumes almost match with selling at open and buying volumes at close. I’m sure a lot of people got stopped out, and some highly leveraged lost their total investment. Swiss vote was a joke priced in, but one of the the the largest gold buyers (India) removing gold import restrictions at the same time seems funny- as we Indians never reject a bargain. I think there is a term for this type of thing in Japanese trading philosophy, but needless to say the weak holder will sell ASAP and the main buyer would buy here. Also calendar wise they have the advantage with tax-loss rules and thinking that the small guys will sell and wait till January to get back in wherever the market is. And the game plays on. As of the brutal Friday, GDX MACD hist is still +ve, 10 MA crossed 20 EMA iand is still above. CMF has not fallen drastically like the fear would suggest – hence the shakeout thought. That alternate is looking extremely unlikely now that Silver made a significant new low. The alternate (which sees upwards movement from here) does not fit well for Gold, is invalidated for Silver, and so for GDX it has reduced in probability. 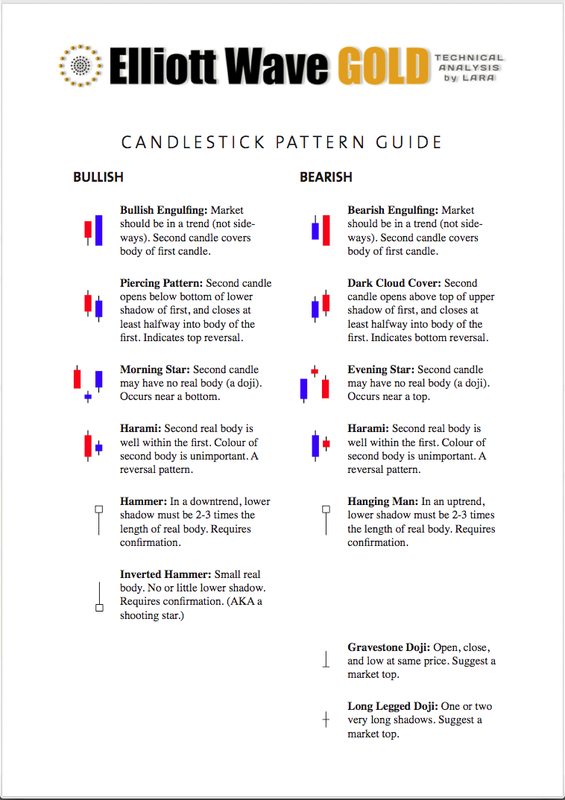 Unless GDX goes up while Gold and Silver go down…. No, I mean the all time high on the monthly chart. Which I had at 66.98. This is a long term outlook. You are correct thank you. Longer term GDX should do very well. Like 1 or 2 years? When this 5-3-5 down is complete on the monthly chart then yes, GDX should go higher. But at the moment its just ending the first 5 down for primary A. After that it needs to go up for primary wave B. Primary A is in its 38th month. B waves are often very time consuming, so primary wave B may go up overall for 38 plus months. Generally….. if this wave count is right!